Coming in anodized aluminum body finish, this Theater-Suction-Unit (Alumi) comes with support of adjustable suction limits that can be also fixed to desired levels. Allowing for consistent suction control, this vacuum gauge come with support of gauge guard as well as polycarbonate labeled jar in 600 ml, 1000 ml, 2000ml capacities. 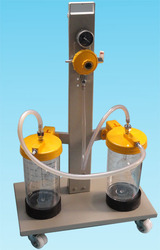 Some of its features include steel handle support, aluminum powder coded stand with wheel support for easily moving regulator to desired place, suitable for use in areas like operation theatres & hospital wards, regulator having aluminum body construction with support of on/off lever, adjustable front knob and others. Our products are designed and developed by making use of finest quality raw material and ultra-modern facilities with the help of our skilled labours. After the development of the offered range, we thoroughly examine these products on quality parameters to ensure their flawlessness. Looking for Theater Suction Unit ?